Bentley's rockstar nursery decor is both a reflection of my and his dad's love of the whole rocker, skull, rockstar get up as well as our baby boy's character. He was born as a preemie at 30 weeks and we spent 2 1/2 months in the NICU which motivated me even more to make his room extra special. Since he proved himself to be such a fighter, what could be better than a rock n roll nursery theme room for his tough, fighter little self? We started off by painting three of the nursery walls a dark gray color with one red accent wall. His name, BENTLEY, is spelled out over his crib in letters that have custom coverings for each letter such as zebra print, musicical notes and shiny colored paint. 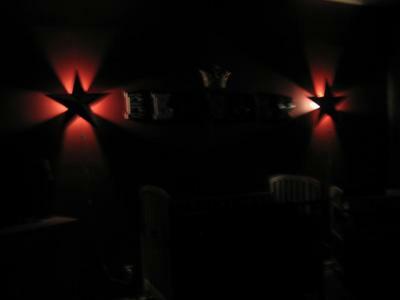 There are two custom stars with built in lights on each end of the baby bed that can be turned on at night. The flooring is hardwood so to soften the surface, we place a large red accent rug in the middle of the room that reflects the colors in the modern red and black baby bedding set and then layered a black peace sign rug over it. His curtains were chosen to complement the rest of Bentley's rockstar nursery decor and are honestly amazing! The curtain's fabric is zebra print and the tiebacks have tiny wooden guitars in the middle. 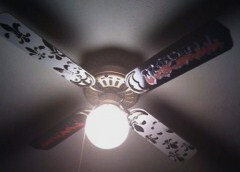 Even the baby's nursery ceiling fan was customized with his name painted in grafitti and Fleur di li's. Our goal was to design a special room that can grow with him since he is our little rock star and we must have succeeded since people that walk into his room are speachless! Jessica, thanks for sharing your creative baby boy nursery decorating ideas with us. If the cool design of this room is any indication, Bentley is definitely destined to be a celebrity! Thanks for sharing your rock n roll nursery decorating ideas with us and be sure to tell your friends and family to stop by and vote for your entry in our baby nursery pictures contest! Where can I buy this bedding? Where or how did you make these star lights? 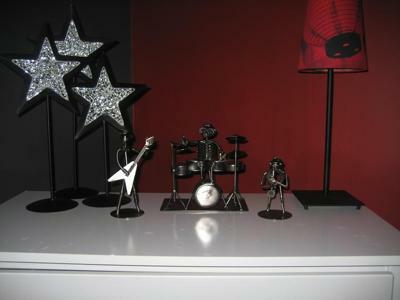 Love the Rock Star Room! You did an amazing job!! This is an awesome room, love all the detail with the ceiling fans & all!!! AWESOME!! I love the theme idea. My husband & I have a rockstar themed nursery as well for our 5week old baby boy. This room gives me more ideas for his room. Great job!! For those about to ROCK we salute you! Yeah! that's a cool nursery! Such a cool musical nursery with interesting stuff not a cookie cutter duplicate. I LOVE it! This baby's gonna be a rock star, I can see it coming! Join in and write your own page! It's easy to do. How? Simply click here to return to ROCK n ROLL NURSERY PICTURES and DECORATING IDEAS.